514-288-8778 THE RECREATIONAL FLIGHT STORE - EVERYTHING THAT FLIES AND MORE! MONTREAL, QUEBEC, CANADA. Panoramic 60 min flight for 3 persons or less. Take off for a one hour panoramic flight over the beautiful Tremblant region. Choose your path. A fantastic flight.The price is good for 3 persons. Maximum combined weight for the 3 passengers of 600 lbs. Add to cart Need help? Panoramic 20 min flight for 2 persons. Take off over a red pine forest, heading to the Diable River and the Tremblant village, see the majestic lake Tremblant and its prestigious real estate , the Iroquois falls, the Red River, the tremblant race track and the splendid golf courses. On the way back you will see lake Ouimet , Gray Rock and St-Jovite village, reach the ground with a smooth landing. A fantastic flight.The price is good for 2 persons. Maximum combined weight for the 2 passengers 500 lbs. It is possible to add one additional person to this package for 49$+tx (To be purchased separately in the online store). Panoramic 30 min flight for 2 persons. This package is good for one additional passenger. This package cannot be bought alone and can only be purchased an an addon to an helicopter package in Mont-Tremblant. Note that the helicopters can carry a maximum of 3 passengers per flight. The maximum weight per passenger is 250 lb. The maximum weight for the 3 passengers combined is 600 lb. 30 minutes flight for 2 persons with a 30 minute stop in nature. Take off over a red pine forest, heading to the Diable River, the forest and the lakes of the Tremblant National Park and the Tremblant village. You will also see the entire majestic lake Tremblant with its great real estate properties, the race track, the golf coursesthe town of Labelle , the Iroquois Falls , the Red River valley, the Mont-Tremblant village and the lake Mercier. On the way back you will see lake Ouimet , Gray Rock and St-Jovite village, reach the ground with a smooth landing. A thirty minute stop on the top a of a virgin mountain will double your pleasure with a magnificent view of lake Tremblant and the valley. A a complementary refreshment will be served. If you preffer, the stop can also be made on a beach of the Devil River. Do not forget your cameras. Maximum combined weight for the 2 passengers of 500 lbs. It is possible to add one additional person to this package for 49$+tx (To be purchased separately in the online store). Panoramic 10 min flight for 2 persons. Take off over a red pine forest, heading to the Diable River and the Tremblant village, see the majestic lake Tremblant , the race track and the golf courses. On the way back you will see lake Ouimet , Gray Rock and St-Jovite village, reach the ground with a smooth landing. A fantastic flight.The price is good for 2 persons. Maximum combined weight for the 2 passengers of 500 lbs. It is possible to add one additional person to this package for 49$+tx (To be purchased separately in the online store). 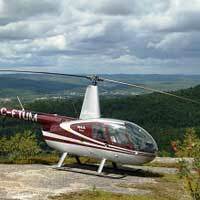 Take the controls of an helicopter at Mont-Tremblant! Duration: 75 minutes including a flight of 30 minutes and 45 minutes of preparation ground school. Follow a ground training with an experienced pilot who will show you how to control an helicopter than take-off for a flight during which you`ll have the opportunity to take over the controls of the helicopter. A fantastic flight. The price is good for 1 person. Maximum weight of 250 lb. 2 additional persons can take place on board for 49$ per person (To be purchased separately in the online store). Dine with style for a special occasion. A wonderfull evening in perspective. A 15 minutes flight with a beautiful panoramic view will take you to a fine restaurant for a great fine cuisine candlelight dinner. The package includes the flight to the restaurant, the romantic dinner, the tip for the service and the ground transportation in the Tremblant area from and back to your hotel, your house or your car. A 15$ credit on your next purchase at Recreational Flight is also included. Package good for two persons. Third person possible for an additional 249$. IMPORTANT: PURCHASE BY PHONE ONLY.